Stories about turkey's legendary power to induce drowsiness resurface every November, but are they true? Don’t blame the turkey for making you tired. The legend of the bird’s power to induce sleepiness resurfaces every Thanksgiving, but feasting on turkey will make you as drowsy as eating a chicken breast or an egg-white omelet — which is to say, not at all. So why does the myth persist? NBC News Health and Nutrition Editor Madelyn Fernstrom suspects it really entered the mainstream after a 1997 “Seinfeld” episode that featured Jerry and George scheming to make a woman fall asleep so they could play with her antique toy collection. After they treat her to a big turkey dinner, complete with a box of red wine and lots of heavy gravy, she’s soon snoozing on the couch. Trytophan is specifically mentioned by the characters as “that stuff in turkey that makes you sleepy.” But that’s not quite accurate. Trytophan is one of the amino acids, which the body uses to make proteins to help it grow and repair tissue. The body can’t produce tryptophan, so you must get it from your diet. 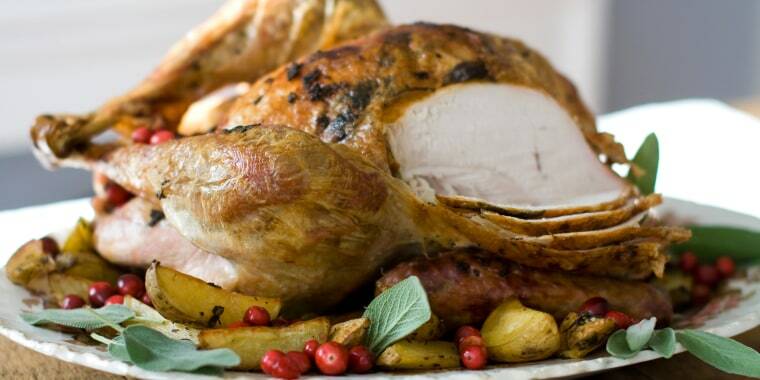 Turkey is a good source, yes, but so is cheese, chicken, fish, milk, peanuts, egg whites and more. Amino acids do more than just build muscle — some of them are the “starter” compounds for brain neurotransmitters, Fernstrom said. “Tryptophan can become serotonin — the brain chemical that calms, causes sleep, among other things — if the right enzymes are around to do so,” she noted. Eating more tryptophan in high-protein foods like turkey does increase the tryptophan going into your bloodstream, but that doesn’t mean your body will turn it into serotonin. Other amino acids are competing with tryptophan to get into the brain using the same entry “door” and because there are many more of these other compounds than tryptophan, there‘s no impact on serotonin levels with a protein meal like roast turkey, Fernstrom said. You’d have more success if you were to eat just mashed potatoes or rolls at Thanksgiving dinner: The way to get more tryptophan into the brain and boost serotonin production is by eating pure carbohydrate, she explained. That releases insulin, which lowers the levels of other amino acids, so tryptophan has a chance to get in to the brain without competition. Why does turkey really make you sleepy? Of course, many people do get very drowsy after consuming a huge Thanksgiving meal. Don’t blame the turkey, though. “That’s due to changes in metabolic activity during digestion. The body has signals to ‘slow down’ and digest the food as a priority,” Fernstrom said. Add the stress of hosting or attending a Thanksgiving dinner (politics at the table, anyone? ), the lack of sleep during the journey to get there, the generous amounts of alcohol and all the sitting around in front of the TV afterwards, and you have the perfect formula for dozing off. The best solution to stay more alert is to moderate your meal. Enjoy all of your indulgent favorites in a smart way — bartering one food for another so that you make room for what you’d really like to eat, and drop items that aren’t as tasty, Fernstrom said. And don’t overeat — put down that fork before you’re completely stuffed.